Institute of banking personnel selection IBPS, recently conducted online examination for the recruitment of clerk cadre in participating organization CWE clerk IV. Examination was held online for upcoming common recruitment process CRP for selection of personal for clerical cadre posts in the participating organization. Online examination was held on 6 December, 7 December, 13 December, 14 December, 20 December, 21 December and 27 December 2014 at various examination center all over India. Results of IBPS clerk Examination 2014. IBPS conducted written Examination online so results will be declared without any delay. According to official notification of IBPS, results will be publish in the mid of January 2015. After that ExamVacancy.in will inform you here when any exact date of results declaration will be available. After the declaration of the results IBPS will start conducting the personal interview test for clerical cadre. For personal interview, call letter will be available from end of January 2015. Personal interview test will be held in the month of February 2015. Provisionally allotment will be done in the month of April 2015. ExamVacancy.in brought previous year cutoff data of IBPS clerk cadre recruitment. 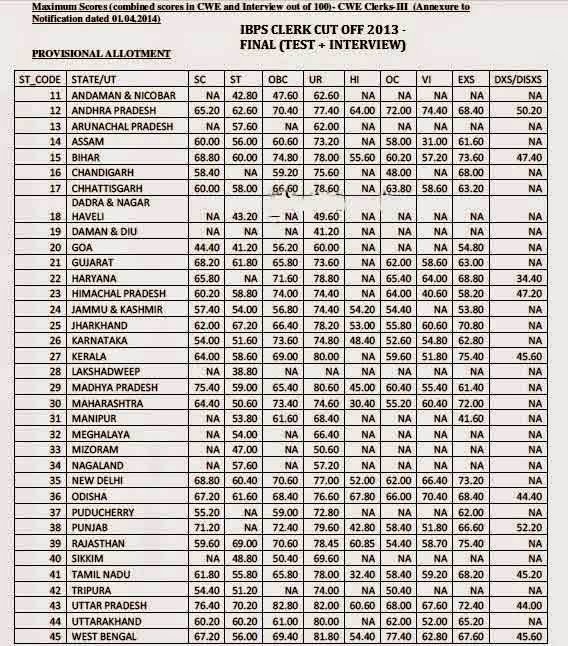 hope this cutoff will be helpful for analyzing the cutoff marks for this year examination.